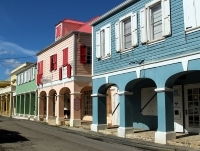 One of the prettiest towns in the Caribbean, Christiansted has a perfect harbour setting and is the capital of St Croix. Dominating the waterfront is the large yellow building, Fort Christiansvaern, built in the late 1700s to protect the town's harbour against pirates during its days as capital of the Danish colony. It served as an important trading centre for sugar and rum. Much of the original Danish colonial architecture remains, including the Old Custom House, government buildings, and the atmospheric wharf area lined with pastel-coloured warehouses. Original Danish streets signs survive among modern enterprises like tourist shops, courtyard restaurants, and a spirited bar scene on the waterfront. There are plenty of beach activities nearby and a popular excursion is a trip to Buck Island, which offers superb beaches and coral reefs.